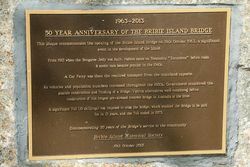 A plaque commemorates the 50th Anniversary of the Bribie Island Bridge. 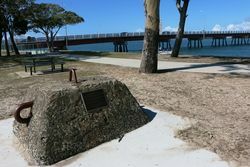 A concrete block which was an anchor for the pile-driving barge is located nearby and also commemorates the 50th anniversary. 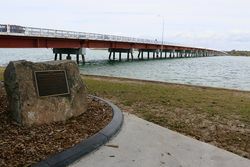 The bridge, which took two years to build , was the longest, pre-stressed, pre-cast concrete bridge in Australia at the time of its construction. Spanning 831.4 metres, the bridge cost $716,321 and had a 10 cents toll to cross it. The bridge officially opened on Saturday October 19, 1963 by the then Premier of Queensland, Frank Nicklin. 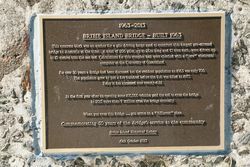 This plaque commemorates the opening of the Bribie Island Bridge on 19th October 1963, a significant event in the development of the island. From 1912 when the Bongaree Jetty was built, visitors came on steamship "excursions" before roads & motor cars became popular in the 1940s. A car ferry was then the required transport from the mainland opposite. As vehicles and population numbers increased throughout the 1950s, Government consider the possible construction and funding of a bridge. Various alternatives were considered before construction of this longest pre-stressed concrete bridge in Australia at the time. A significant toll (10 shillings) was imposed to cross the bridge, which enabled the bridge to be paid for in 12 years, and the toll ended in 1975.